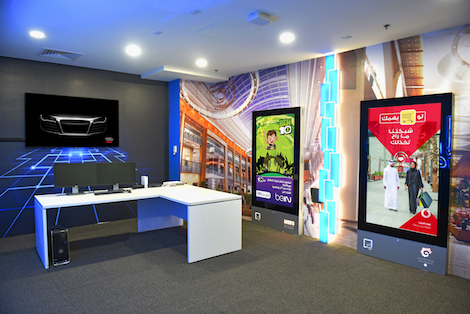 ELAN Media, Qatar’s leading Out-of-home advertising business has given us an interesting behind the scenes glimpse of their content delivery to 242 digital screens operating in Mall of Qatar, Doha Festival City, and Ezdan Mall. Elan Live has three large screens including 2 digital MUPIs similar to those available in the malls and provides advertisers with the opportunity to watch a real-time preview of their campaigns before they go live, giving them full control over their communication. Jamie Ball, COO at Elan Media told us “We are extremely proud that the Mall of Qatar, Doha Festival City and Ezdan Mall has chosen us to be their exclusive media partners, the launch of Elan Live is another show of our commitment to deliver the best advertising experience to our audiences, our clients, and our partners. Our digital out-of-home networks offer brands a new, powerful and engaging way to target their customers, and it is Elan Live that will enable us to do just that. Elan Live will create a new dynamic and ensure that advertising on the Elan Digital OOH networks will work harder and smarter for brands, enabling them to deliver exactly the right marketing message to the right people at the right time.”. Elan media, established in 2004 as a subsidiary of Elan Group to create innovative communication landscapes across a mix of media channels is a diversified and fully integrated group in the Middle East operating across Media, Entertainment, Events, and City Beautification. The Torch (Doha Festival City): the largest roadside digital screen in Qatar, visible from a long distance and wide angles. 176 Digital MUPIs distributed across all the malls. This entry was posted on Wednesday, March 1st, 2017 at 12:15 @552 and is filed under DailyDOOH Update. You can follow any responses to this entry through the RSS 2.0 feed. You can leave a response, or trackback from your own site.